Construction abounds near Broadway and Wilson. The Wilson L is halfway complete. The McJunkin Building is undergoing repairs. Something is brewing in our favorite little "Indian Chief" building at 4629 N. Broadway. The mid-rise proposed for the NE corner of Broadway and Wilson is going through the city planning process. One of the grungiest buildings on the 4600 block of Broadway is now shining like a new quarter at 4635-4641 N. Broadway as new ground level stonework is being installed with windows to follow. 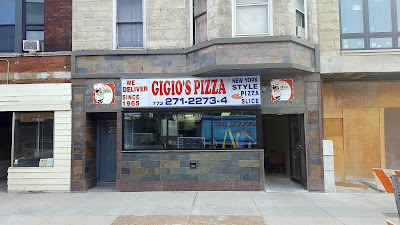 And to top it off, long-time Uptown pizza joint Gigio's has seriously upgraded their street presence. We've been following their progress since work began a few months ago. Gone are the yellow shingles and hand-painted, faded signs filling the windows. In their place are slabs of granite and slate. The entrance to the apartments above Gigio's has been refreshed. New storefront windows have been added, minus the old steel grates that protected the business from break-ins. The front door has been relocated and could it be? Air conditioning? Judging from the recessed space inside over the front door, patrons should soon be able to enjoy air conditioning as they dine on a slice of New York pizza. Inside, new tile has been installed. A long granite slab sits under the new windows so patrons can watch the flurry of construction going on outside. If you haven't tried a slice of pizza from here because the old exterior was less than inviting, we suggest you check it out. Will all this development drive the beggars and criminals away?